As we were away over Christmas we didn't have a Christmas lunch with the family. We decided to rather do it on New Year's Eve and both Ouma and the In-Laws came over for a braai tonight. 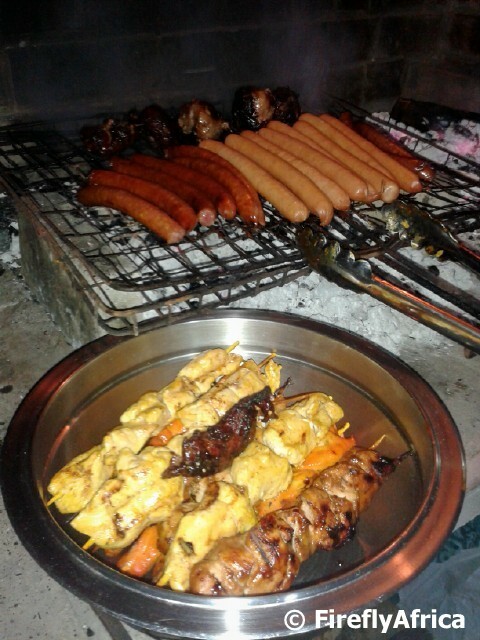 Chicken sosaties, cheese sausage, kabernossies (a smoked russian type of sausage), skildpaadjies (minced liver in net fat) and braai broodjies (toasted sandwiches with cheese, onion and tomato made over the coals). As I type this my MIL's trifle is being dished up so before I sign off and go and have dessert I just want to wish all of you a Happy New Year. May all your wishes come true in 2016. Check ya'll next year. We had to go and do a little shopping at Baywest Mall this morning and as always stopped to watch the skaters on the ice rink. I tried to think how long it's been since the one at the old Tramways building closed down. 20 odd years? 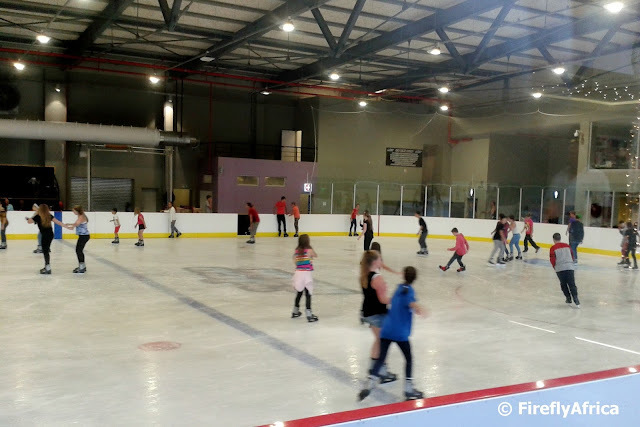 The folk of PE had to wait a long time to glide over the ice again and looking at how good some of the skaters are I imagine a few of them are regulars. I even noticed the other day that there is ice hockey now as well. Great to see the locals support the facility. Standing in Fort Frederick looking towards Central the Donkin Lighthouse and Great Flag can be seen on the Donkin Reserve. The building obscuring the lower part of the lighthouse is the Prince Alfred Guard Drill Hall. When last have you been to Fort Frederick? Most of us get to visit the fort as kids while on a school tour of the city, but I bet a big number of Port Elizabethans have never been back there as adults. Seeing that yesterday was Christmas there was no Video Friday post. I decided to not skip the video of the week though so here it is today. How many of us didn't swim in the "wave pool" in front of Something Good at Pollok Beach when we were kids? To think of it, I should take my kids there again. The video is another time lapse by Dunkan Noakes. May this day be a special one full of love, happiness and lots of blessings. The Christmas tree in the picture was photographed in the Boardwalk Hotel lobby. I wonder how many people who have seen the mosaic art piece on the Donkin Reserve next to the pyramid have noticed that the only known portrait of Lady Elizabeth Donkin has been incorporated into it. 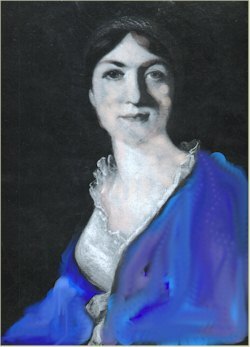 Elizabeth Frances néeMarkham was the young wife of Sir Rufane Shaw Donkin and died of fever shortly after child birth while Donkin was stationed in the East. Elizabeth was the eldest daughter of the Very Rev Dr George Markham, dean of York, and the grand-daughter of the then late Archbishop of York. After her death Sir Rufane came to the Cape where he was the acting Governor from 1820 to 1821. 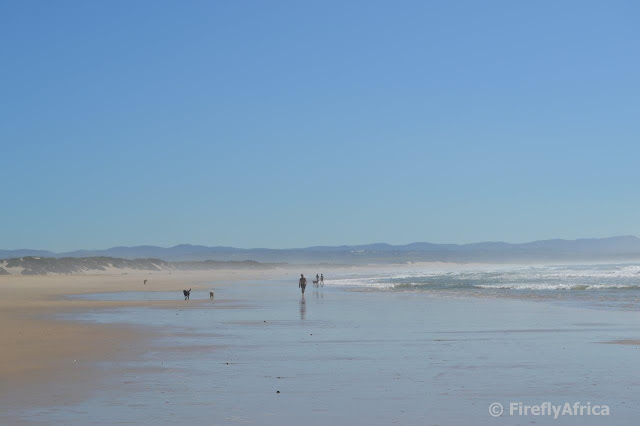 While in Algoa Bay to oversee the landing of the British Settlers in 1820, he named the town in memory of his wife and in August of that year he erected a memorial to her on a hill overlooking Algoa Bay. This hill is what is known as the Donkin Reserve today and the memorial is the pyramid next to the lighthouse. Sir Rufane committed suicide on 1 May 1841 on what would have been their 26th wedding anniversary. I got to face my fear of heights at Pine Lodge the other day and walked away a better man for it. 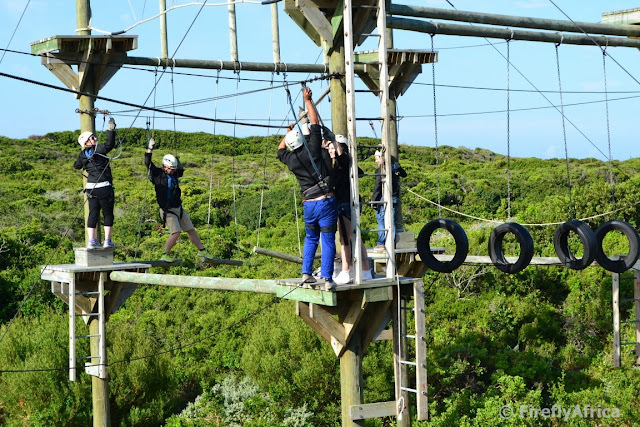 Pine Lodge not only introduced a zipline to the public, but also a new high ropes course. The high ropes course consist of two levels with four challenges per level.. We only had time to do the bottom level which is about five meters off the ground. To get to it you warm up on a little rickety bridge followed by a cable walk, and then the fun starts. 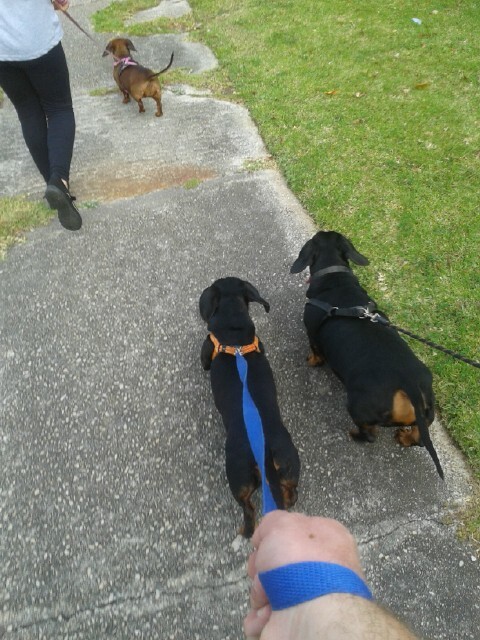 That's me in the shorts busy with the "Elvis Walk". Believe me, it looks a lot easier than it really is and having a fear of heights didn't make it any easier. I nearly turned around after my first try to cross from the first to the second hanging pole, but I persevered. Your hips and legs truly emulate Elvis while trying to do it and I'm sure I didn't breath for most of it. Although I must have cause between the lot of us the age restriction for language was pretty high. That is me again coming down the last cable walk after the tyre climb. 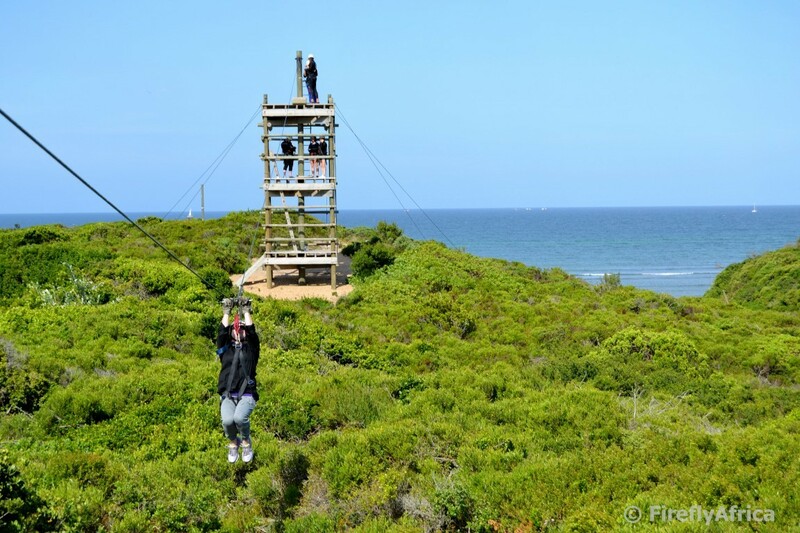 If you have a bit of time on your hands this summer holiday you have to go and do the zipline and high ropes. It's worth it. Looking for something a little different to do around Port Elizabeth this summer? 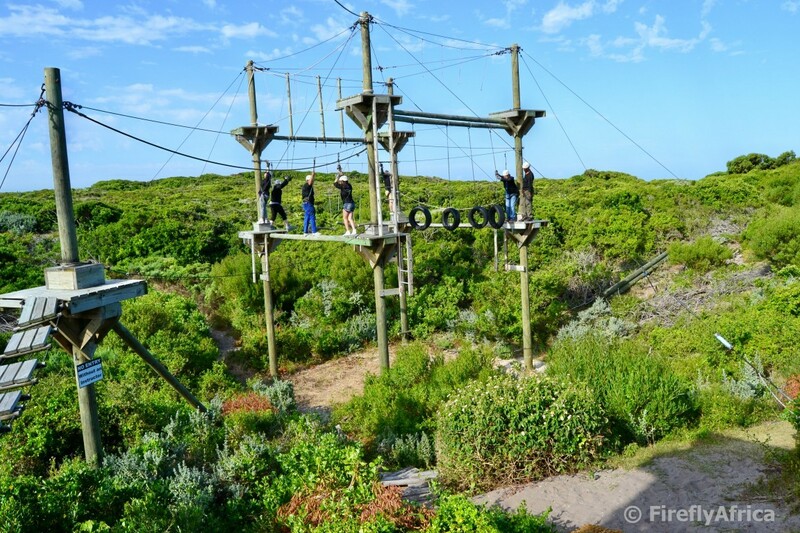 Why not try out Pine Lodge's zipline? 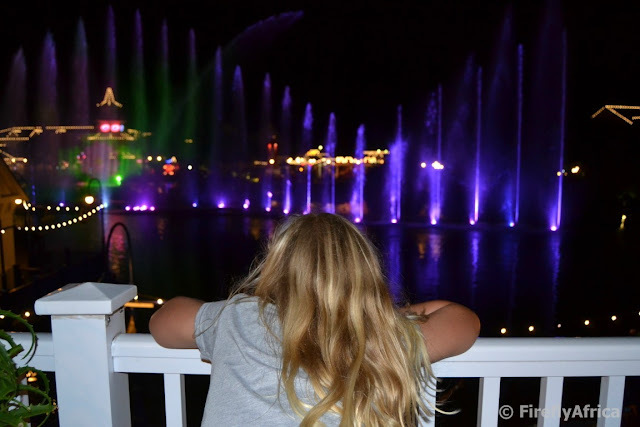 Even though it's been there for probably a year or two now, Pine Lodge has decided to really start pushing all the activities one can do at the resort to both in-house guests as well as locals and other visitors to the city. The three slide zipline is located right next to the resort and is nice and easy to do. 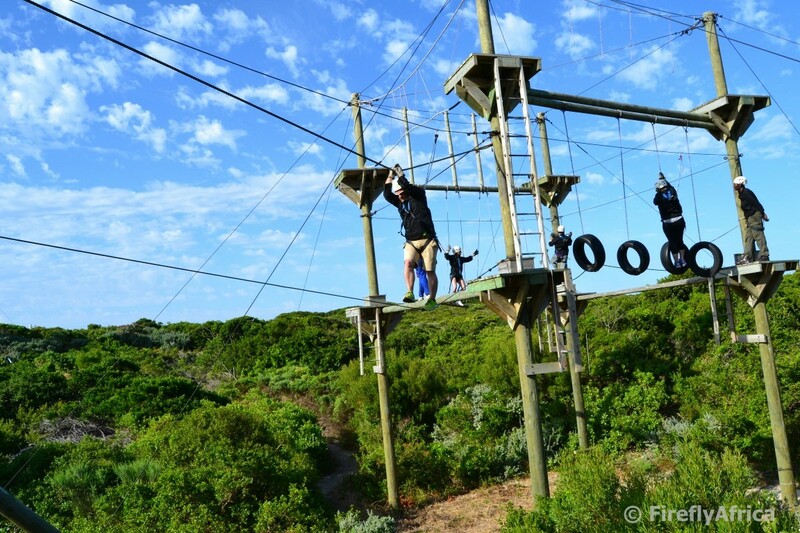 It's high enough to give you the real zipline thrill yet manageable for both young and old. The platforms also give great views of the surrounding area and coastline and you can see all the way to the lighthouse at Cape Recife. Drama Princess watching the Boardwalk Fountain Spectacular from the balcony of the La Vino Wine and Tapas Bar at the Boardwalk. The best seat in the house if you ask me. Port Elizabeth is an awesome place. Viva Port Elizabeth!!! Viva!!!! Haters are quick to say that tourists don't come to Port Elizabeth. They are wrong. Tourists do come. You just need to go around the city and have a look and you will see them. There are coaches parked at hotels. Tourists walking around the beachfront and through the Boardwalk. Addo Elephant National Park and all the surrounding game reserves are full of tourists. 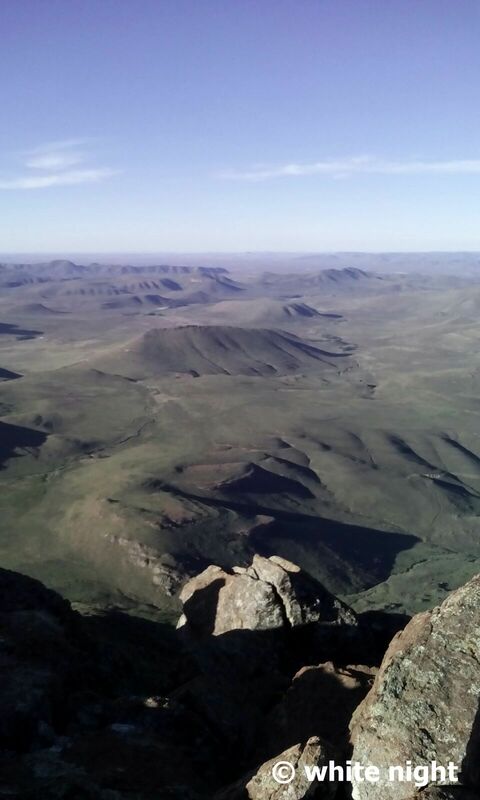 They are visiting local attractions like Kragga Kamma Game Park, Bayworld, SAMREC, the Donkin Reserve and more. They are around. If only we could keep them here longer than a day or two though. I promise you though. Once they leave they all say that if only they knew how great a place it was they would have stayed longer. 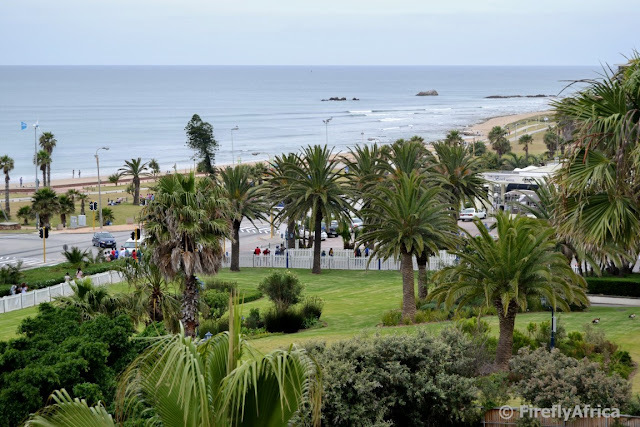 Perhaps they should all follow Port Elizabeth Daily Photo. If you have never flown into Port Elizabeth, I have something for you today. If you have flown into the city before I'm sure you'll still enjoy it. This week's Video Friday post is a video by Angelo the Explorer shot out the window of the plane as he came in for a landing in Port Elizabeth. It starts as the plane comes in from the east over Kings Beach, then Humewood and Forest Hill before touching down. 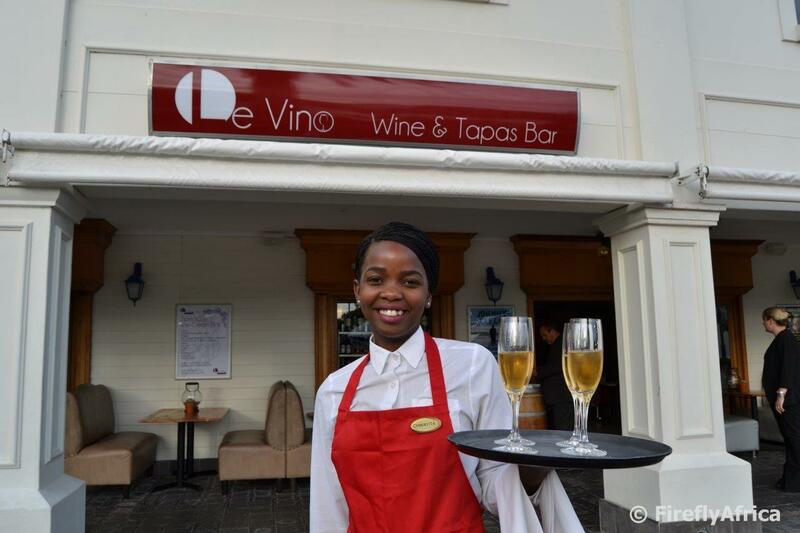 Last week I got to attend the launch of the new Le Vino Wine and Tapas Bar at the Boardwalk. Le Vino is in the space where Dulce used to be and has a great upstairs area with a balcony. It's on this balcony we sat watching the sun go down over the Boardwalk lake with a glass of wine and some yummy tapas. 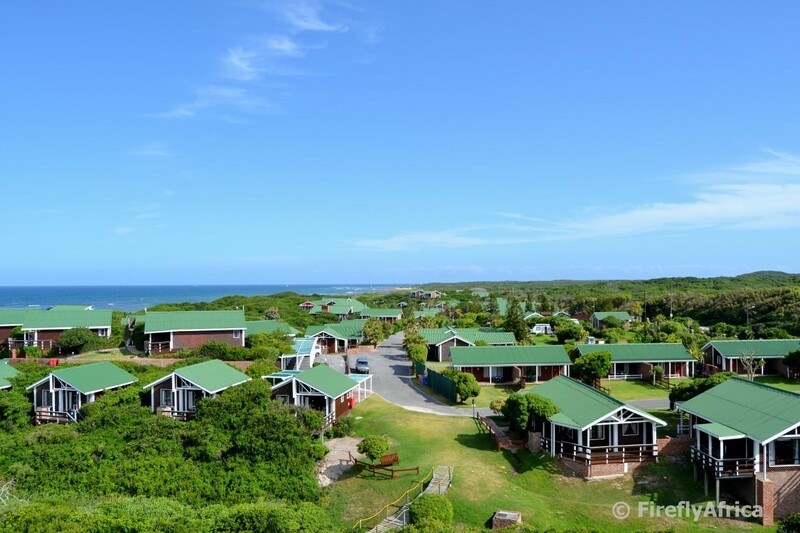 A week or so ago Pine Lodge at Cape Recife celebrated their 25th birthday. I was invited to the events of the day and snapped this pic of the resort from the first zipline platform. What is great of Pine Lodge is that they offer a range of accommodation types from camping and self catering to more luxury accommodation in their honeymoon suites. Add to this all the activities, including ziplining, high ropes, thick wheel bikes to ride on the beach, kiddies play area, donkey cart rides, guides walks and visits to SAMREC and the Cape Recife Lighthouse as well as a huge pool, the new River Spa, a restaurant and the beach just over the dune and you have the perfect holiday resort for this summer. Fort Frederick is the oldest building in Port Elizabeth and said to be the first permanent stone structure built by the British in Africa south of the Equator. The fort was built in August 1799 near the mouth of the Baakens River in Algoa Bay to safeguard the fresh water supply and to keep watch for a possible landing of French troops send to assist the Graaff-Reinet rebels during the Napoleonic wars. The fort was named after Frederick, Duke of York and then Commander of the British Army. The British abandoned the fort in 1802 after which it was temporarily occupied by Thomas Ferreira and a group of local burghers. In May 1803 they were replaced by a contingent of 150 men of the Batavian Republic and three years later, in 1806, it was again taken over by the British after the second occupation of the Cape. The fort was abandoned after 1868 and fell into disrepair. The fort later became a national monument and was mostly restored. 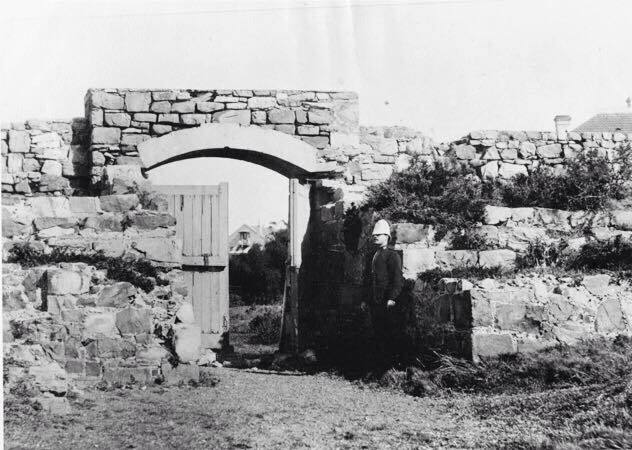 The fort contained a powder magazine and a blockhouse, which has lost its timber upper storey. It was originally defended by two 8-pounder guns and one 5.5 inch Howitzer. These guns were removed when the fort was abandoned and today contains a selection of muzzle-loaders dating from the later part of the eighteenth century. Even though the fort was built to defend the Bay, it never fired a shot in anger. On the north side of the fort lies the grave of Captain Francis Evatt, Commandant of Fort Frederick between 1817 and 1847. 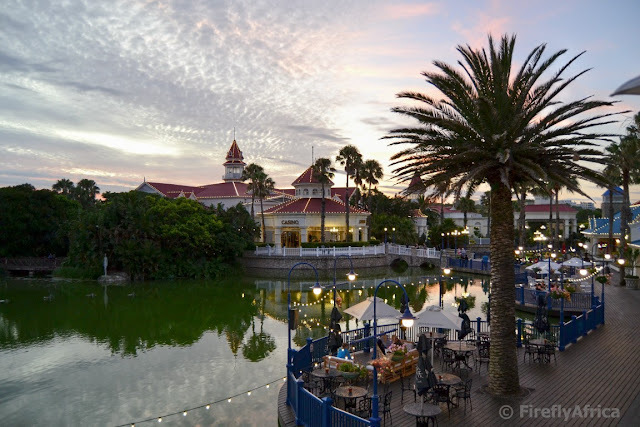 Captain Evatt is often referred to as the Father of Port Elizabeth because of the part he played in the town's early development as well as overseeing the landing of the 1820 British Settlers. and this is what it looks like today. The powder magazine is the little building on the left. The Fort Frederick gateway and ramparts with a British soldier in uniform standing at the gateway. The photo is dated 1895. 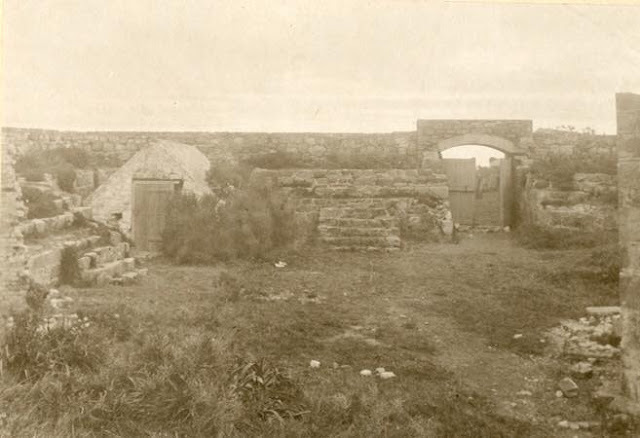 This was taken after the fort was abandoned for it's original purpose of guarding Algoa Bay. The gateway as it looks today. Notice the chimney top right that is visible in both pictures. 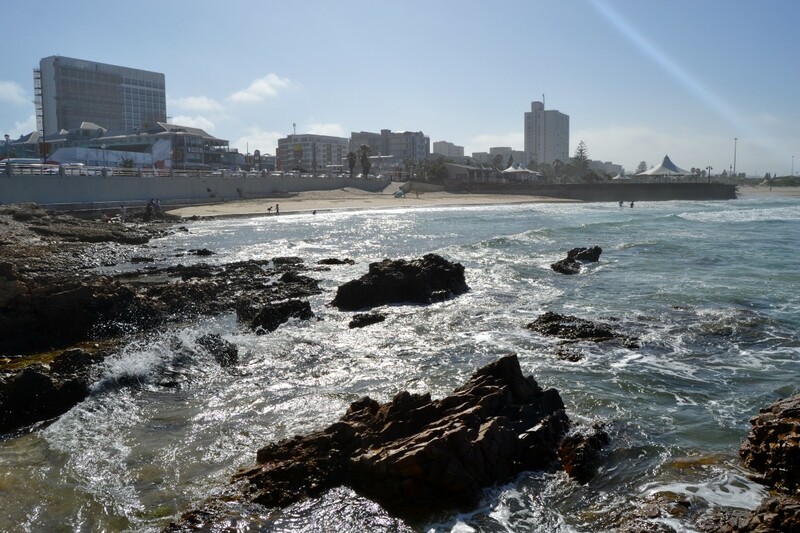 The Donkin Reserve and Route 67 truly are two of Port Elizabeth's iconic attractions. The one is historic and linked to the very early history of the city while the second brings together all the aspects of the city's cultures, history, peoples and art. The pyramid is actually called the Donkin Memorial and was built in 1820 by Sir Rufane Donkin in memory of his late wife after whom he named the town. 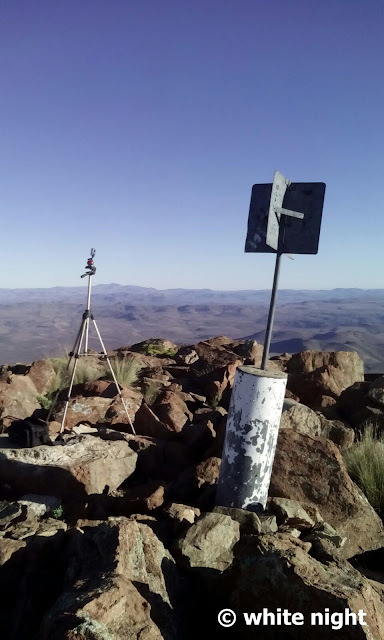 Next to it stands the tallest flag pole in South Africa (65 meters) flying the biggest South African flag (10m x 15m) in the world. This is the view standing on the Boardwalk Hotel's pooldeck looking towards Millers and Pollok Beach. The middle rock of the lot is Bird Rock and Hobie Beach is just to the left of the picture. With all the palm trees one who don't know the PE beachfront could easily think it's somewhere tropical. Heck, with some of these hot and humid days we've been having it could just as well be. 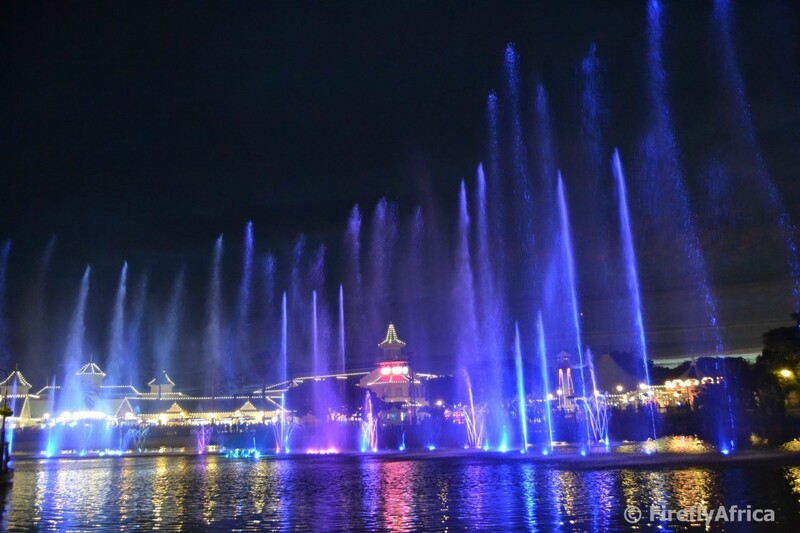 Over the last couple of years the Boardwalk Fountain Spectacular has become very popular with both locals and out of town visitors visiting the Boardwalk in the evenings. The fountain times vary between the seasons and at the moment the times are 8 pm, 9 pm and 10 pm daily. The Video Friday post for today is another time lapse. It was shot from somewhere in South End looking towards the harbor. It's only 15 seconds long so no excuses not to watch it. Last night I joined some media friends at the Boardwalk for the opening of the newest restaurant offer in the complex. 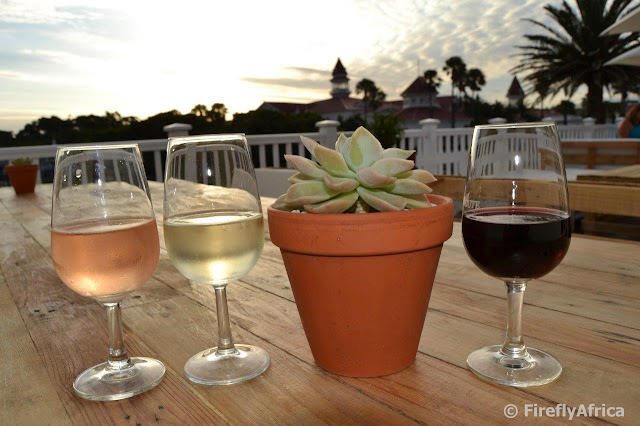 In recent months the Boardwalk has opened two new restaurants, Coast and Craft, and these are now joined by Le Vino Wine and Tapas Bar. All three of these fall under the Boardwalk's own banner and is managed by the Boardwalk's F&B department. Le Vino itself is located in the old Dulce Cafe premises and offers a great spot for wine lovers to sit and watch the sun go down over the Boardwalk lake while trying out the restaurant's extensive, and believe me it is extensive, wine list. Our evening started with wine, obviously, and a couple of tasters of what was to come later on. After the formalities we all headed outside for the annual Sparklers event, followed by the Boardwalk Fountain Spectacular, before it was time to try out the food. 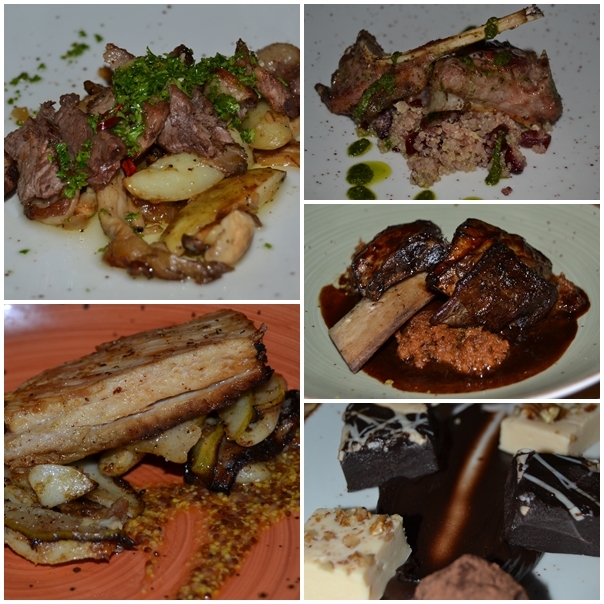 The food at Le Vino is tapas style ranging from lamb chops, pork belly and short rib to my favorite of the night, fish with among others, litchi in the flavoring. Wow, I need to find out how they did that cause it really was a winner. The menu isn't that extensive but the fare on offer is worth it. My recommendation isn't to go there for a full on dinner, but rather make it your starter stop. 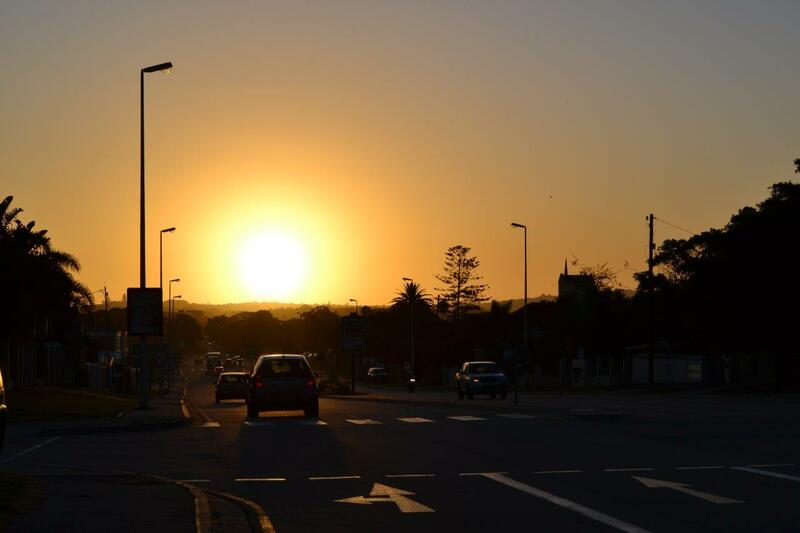 Enjoy the sunset from the upstairs balcony while sipping wine and enjoying some tapas for your evening's starter before moving on to Coast next door or Craft on the other side for your mains. When it comes to fun science, everybody becomes a child. It's no difference at the NMB Science and Technology Centre in Uitenhage. There are so many fun and fascinating things to try. Things like lying down on a bed of nails to just name one. Another one that always fascinates me is the floating ball. How do they do it? Looking for something to do with the kids this holiday? 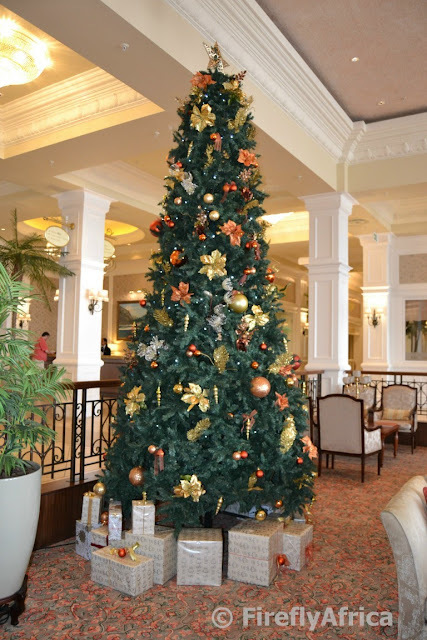 Why not head out to Uitenhage? 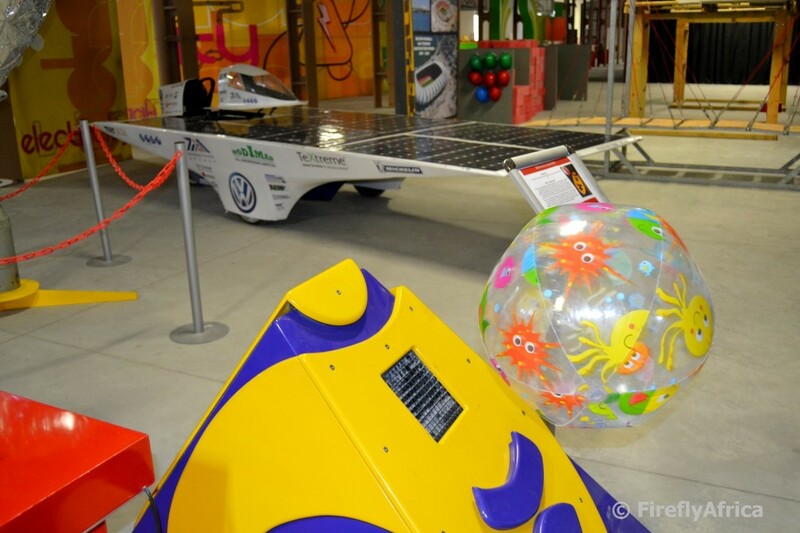 The town has a few worth while spots to visit to keep the kids busy at. 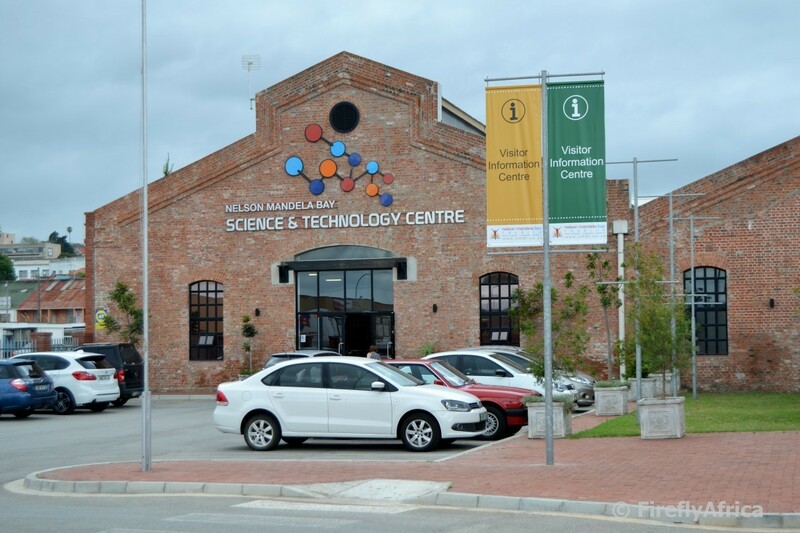 Start at the Cuyler Manor Museum, visit the world class VW Auto Pavilion and round the day off at the Nelson Mandela Bay Science and Technology Centre. Although the centre really has the potential to be so much more than what it currently is, it's sure to keep kids big and small busy for a while as they try out all the marvels of science explained for kids to understand. Plus it's all hands on. More info is available on the listing on the NMBT website. 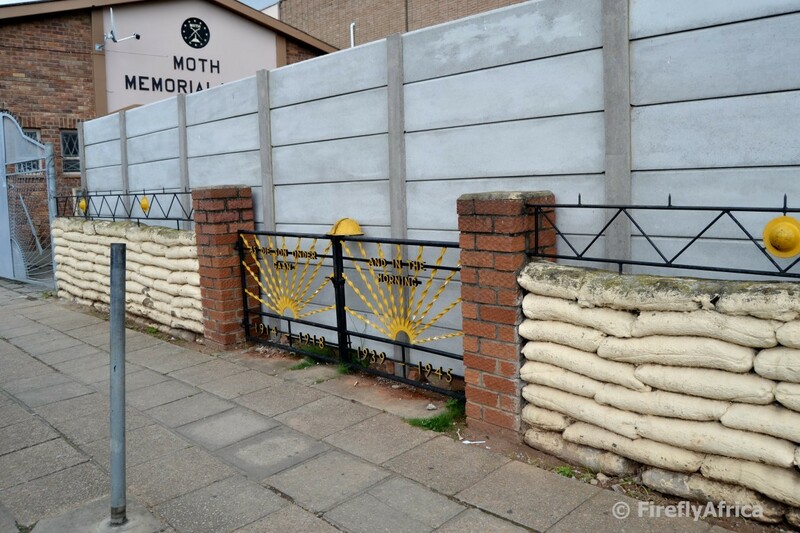 In January I did a post about the Grave of Joseph Crowe at the Moth Memorial Hall in Uitenhage. Last week I was in town for a meeting at the NMB Science Centre nearby and drove past the Moth Memorial Hall just to find a vebracrete wall has been erected behind the little boundary wall that looks like sand bags. How thoroughly disappointing that the public can't see this anymore. 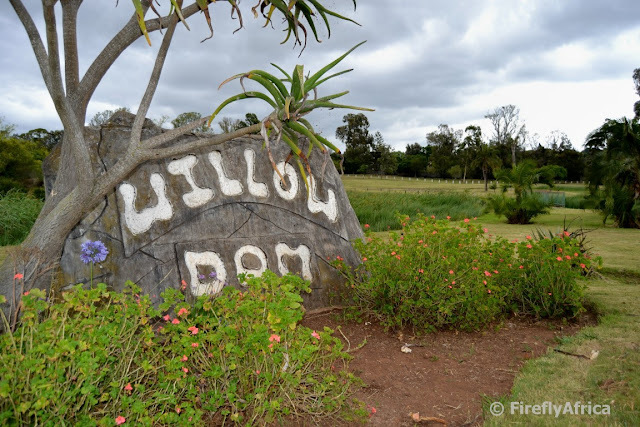 Uitenhage's Willow Dam and its surrounding park has always been a very popular recreational spot in the Garden Town. For a while it seemed to have gone downhill a bit and people stayed away because of a bad reputation that was developing, but that is changing again. People are returning to Willow Park to picnic and play, there's a weekly market and the park is once again nicely maintained. Some time this week I decided to swing through Mill Park to do a new cache that was published in the area. The cache is called The Forgotten Staircase and on my way there I kinda wondered what the name of the cache referred to. Turned out to be an actual stairway linking Mill Park with Target Kloof below. 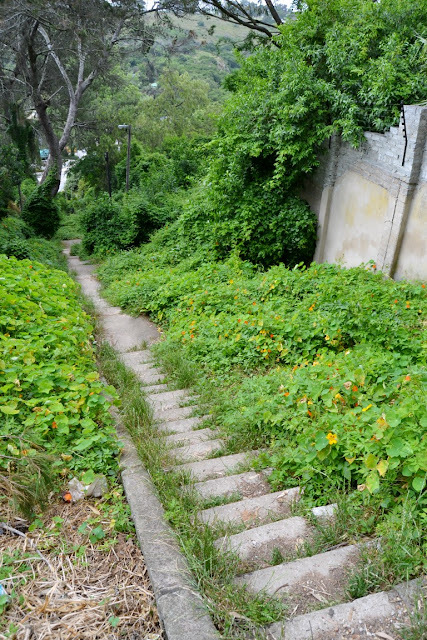 While looking for the cache three separate people came past so, looking at how overgrown the steps are, the only people who seem to have forgotten the stairway is the municipality who hasn't cleared it for probable some years now. Today's Video Friday post is another of Duncan Noakes' excellent time lapse videos. This one is of the iconic Donkin Reserve and the Port Elizabeth harbour beyond as the sun goes down. Stunning! Driving past Kings Beach yesterday morning I noticed that "Playland" (because that is what we still call it even if it has a different name these days) is busy setting up for the coming summer holidays. Just the day before Cat Anderson James posted a Fun fair Then and Now on the Ex PE 60's 70's, 80's group on Facebook. If I'm correct the "Then" fun fair was located somewhere around Humewood beach. The "Now" photo I took a year or two ago during the day so no activity at the time. I just love the fact that there is a Ferris Wheel in both. 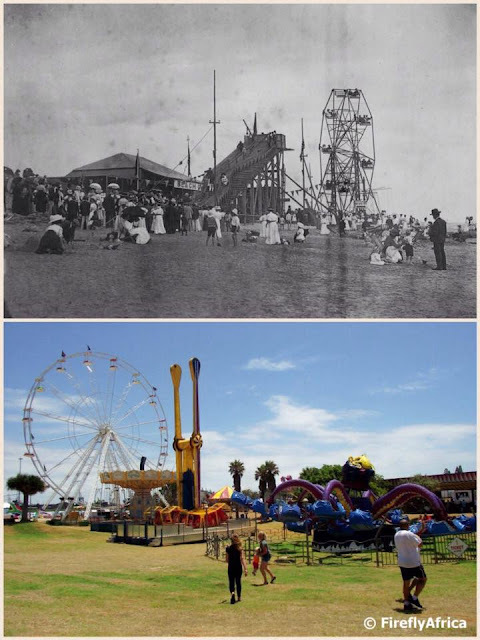 Do you know where the Ferris Wheel got it's name from? According to Wikipedia: "The original Ferris Wheel was designed and constructed by George Washington Gale Ferris, Jr. as a landmark for the 1893 World's Columbian Exposition in Chicago. The term Ferris wheel is used generically for all such structures, which are now the most common type of amusement ride at state fairs in the United States. Since the original 1893 Chicago Ferris Wheel, there have been nine world's tallest-ever Ferris wheels. The current record holder is the 167.6-metre High Roller in Las Vegas, US, which opened to the public in March 2014." Looking towards Denville Beach and the McArthur Pool Complex in the late afternoon standing on the little surf wall I posted about a few days ago. 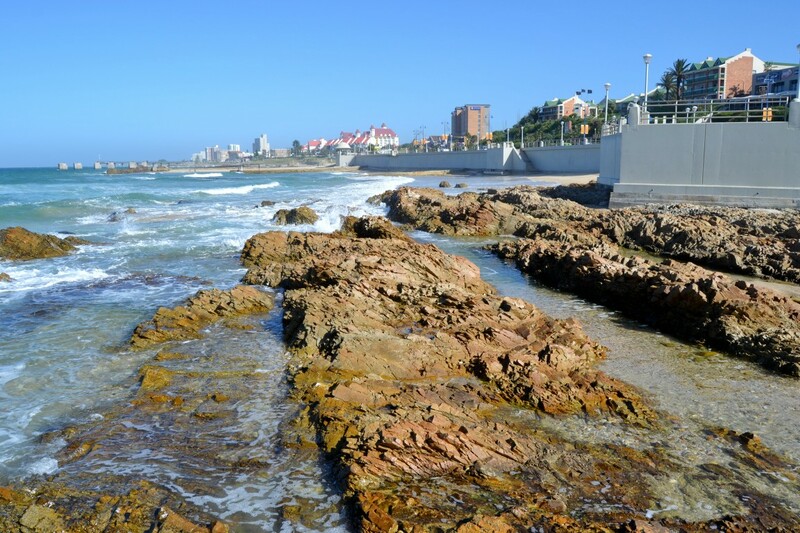 I just love the Port Elizabeth beachfront. 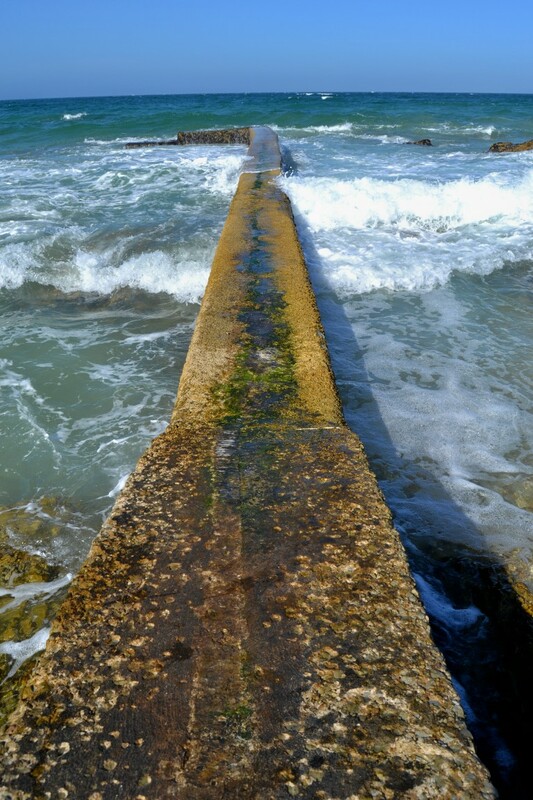 I love that you can walk or go for a jog all the way from the harbour wall to the lollipop beacon in Summerstrand. I love that we have a clean beachfront. I love that it isn't over developed. I love the stunning views. I love our swimming beaches. I love that so many different watersports can be done on our beachfront. I just love the Port Elizabeth beachfront.